We all know MUFA rich oils like olive, rice bran, mustard, and canola are good for us, whereas, oils from coconut and palm have saturated fats and are bad for us. Knowing this distinction is good, but what is also very important, is to know that, each one has a different chemical composition and smoke point. It is not just about choosing healthy oils, knowing how to use them is equally important. One should know, which one will be best for sautéing, frying or baking and which oil should be used exclusively as a salad dressing. 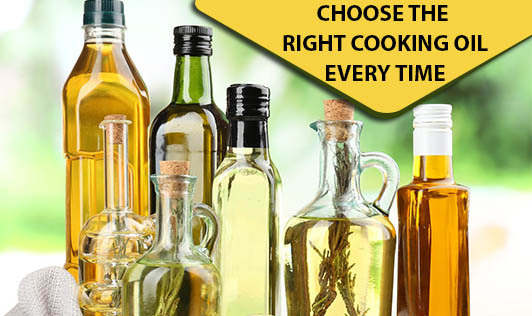 Olive oil- Olive oil is one of the healthiest oil. It is available as extra virgin olive oil and virgin olive oil. Extra virgin olive oil- Extra virgin olive oil is produced from first, cold pressing the olives, and is the best quality olive oil with highest MUFA content. It has very low smoke point and should not be used for cooking. You can use it for salad dressings. Virgin olive oil- Virgin olive oil is also produced from first, cold pressing of olives, but it has less robust flavor and better smoke point than extra virgin olive oil. You can use it for low and medium temperature cooking like cooking stir fried vegetables or seared meat. Refined olive oil- Refined olive oil is chemically treated to neutralize its flavor and is suitable for high heat cooking. Peanut oil- Peanut oil has very high smoke point and is stable at high temperature. It is a good choice for frying and stir frying food. Soya bean oil- Derived from soya bean. It is chemically refined to remove flavor and color. It has a high smoke point and is ideal for baking and deep frying. Sunflower oil- This PUFA rich oil is rich in vitamin E, has a high smoke point and can also be used for frying. Rice bran oil- The most popular oil is rich in vitamins and antioxidants. Though ideal for frying, it's better to use it for low and medium temperature cooking to reward yourself with its health benefits. Mustard and Sesame oil- They both have a distinct strong flavor and are ideal for cooking Asian cuisine and light frying. Flaxseed or Linseed oil- Produced from flaxseeds and has an earthy flavor. Flaxseed oil quickly turns rancid at room temperature and should always be refrigerated. It also has a low smoke point and can be used as a salad dressing. Coconut oil- It has a sweet, nutty flavor and is most stable on heating. Though it is ideal for deep frying and baking, it should be used with caution, as saturated fat in it is linked to diabetes and heart disease. Along with quality, maintaining the quantity of oil is equally important. No oil is good, if you fail to limit your oil intake to half liter per person per month.